A. 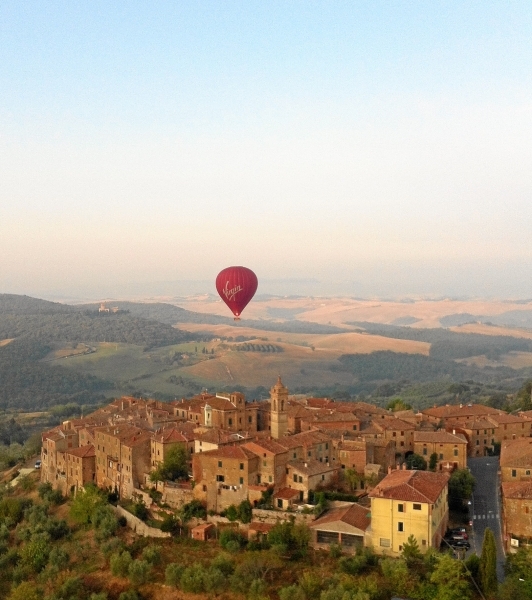 The area in which we fly spans across parts of Tuscany and Umbria, it starts from Cortona and Montepulciano in the south to Florence in the north. It consists of rolling hills and steep valleys, villages on hilltops, and isolated farmhouses and castles. Closer to earth we can chat to farmers clipping their olive trees or seeing to their vines as we coast by down the valley, looking for a place to land, skirting castles and villages that have not changed in centuries. It is a well cared for landscape that is a pleasure to behold. A. Book an hour-long walking tour of the village to learn its history, and to feel at home. Visit surrounding villages, monasteries, Etruscan and Roman ruins and enjoy a coffee or glass of wine in a village piazza or take day excursions to see the great art and architecture of Tuscany’s historic cities Florence and Siena where you can shop for Italian designer wares and hear Gregorian chants. Wander through Arezzo, famous for antiques, or relax in the hot mineral waters of Bagno Vignoni. Take a lesson or two in painting and drawing with one of Montisi’s professional artists or book a wine tour or a tasting either in Montisi, or in the nearby wineries producing Brunello, Chianti and Vino Nobile. A. We generally schedule hot air balloon rides seven days a week from the middle of May to the middle of October, depending on annual variations in weather conditions. Our balloon flights take place in the morning around sunrise, the exact time is depending on the time of year and will be confirmed with you before the flight. A. 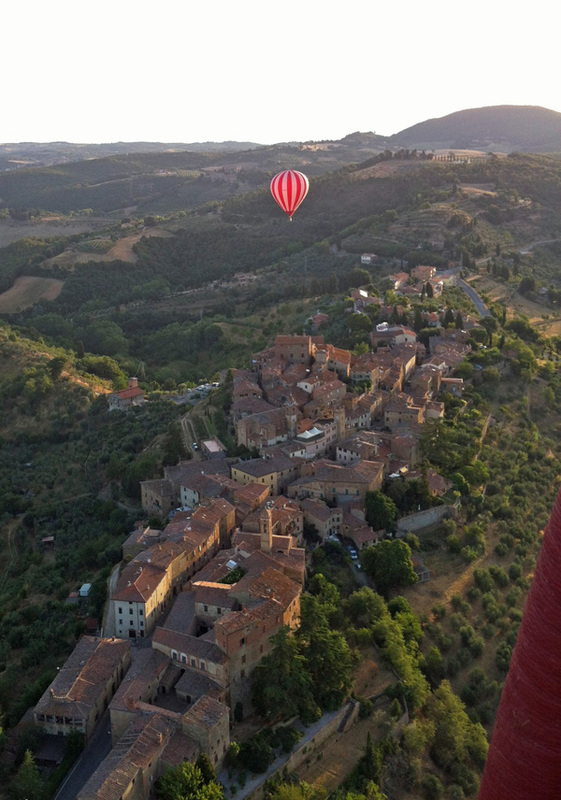 Flying in a hot air balloon is a very serene experience while in the air, but it is an adventure activity in the great outdoors and sometimes on landing the basket can tip and/or drag along before coming to rest. This is how balloons have been landing for over 200 years and it’s perfectly normal and safe. 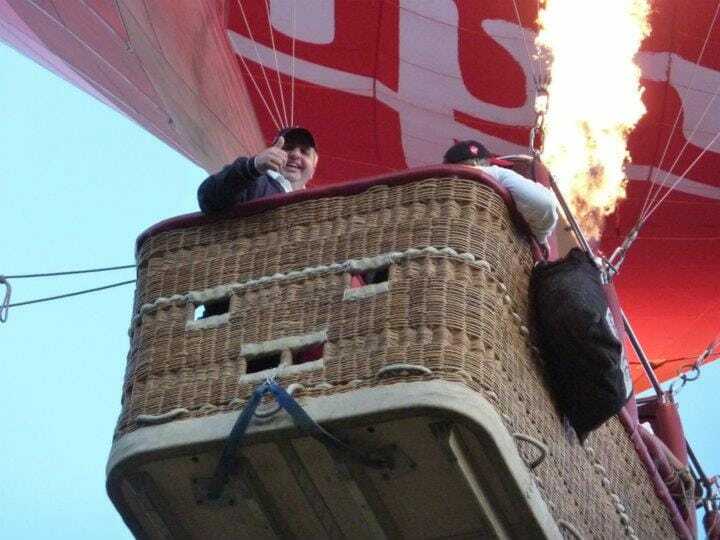 The balloon and basket are designed for your comfort and safety throughout the flight. During landing you will be in the safe landing position within the basket as instructed by your pilot. Many people say the landing is their favourite part of the flight. A. Our larger balloon during the 2014 season carries eight to ten people, and our smaller balloon up to four people. A. Children must be aged seven or over, and of a height to be able to see over the edge of the basket. We recommend that under 16s are accompanied by an adult. Passengers must be physically able to climb over the side into the basket with the steps provided, stand unassisted for an hour and adopt the seated landing position. You should also be sure you don’t have any pre-existing medical conditions which could be affected by the ballooning experience and seek medical advice if unsure. Anyone weighing over 20 stone (127kg/280lbs) will be required to pay a supplement. We are unable to fly passengers who are pregnant or have recently had major surgery. A. 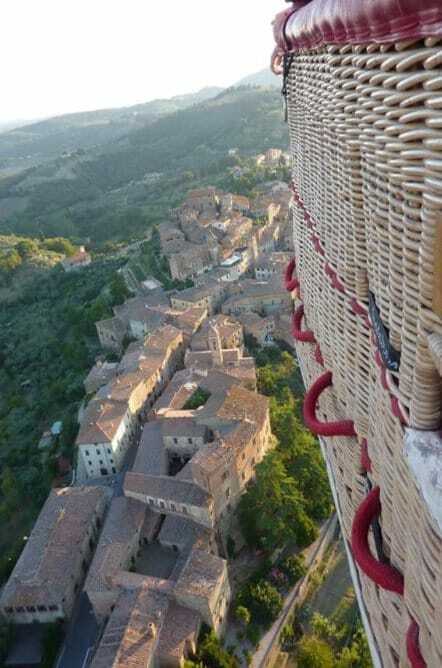 Hot air ballooning is an extremely safe activity which is regulated and Ballooning in Tuscany is licensed in Italy for commercial passenger balloon flights by both the British and Italian Civil Aviation Authorities. We follow strict safety guidelines and use the latest ballooning equipment. Our pilots are highly experienced and hold full commercial balloon licences. A. If we have to cancel your flight because of weather or other reasons outside of our control, we will do our best to re-arrange your flight during your vacation. If we are unable to do this we will give you a full refund within five working days of the flight date. You can cancel up to 30 days before the flight date and receive a full refund. If you cancel within the final 30 days up to the day before, you will receive a full refund less a 10% admin fee. If you cancel after 12 noon the day before the flight you will not be entitled to a refund. However, if you have to reschedule with short notice we will do our very best to accommodate you on another flight during your vacation. This is obviously subject to space being available and cannot be guaranteed. Don’t forget—ballooning is a weather dependent activity so if the flight has to be cancelled and cannot be rearranged at your convenience then we will give you a full refund within five working days of the flight date. Paying with PayPal makes it very easy for us to do potential refunds since we can simply, with a click of a button, refund your PayPal account. Please note that some bank transfers can take time to reach you depending on who you are banking with. If you are experiencing any delays please let us know so that we can email you a copy of our bank transfer document which allows your bank to trace any delayed payments.